have a clearer understanding about development in children and be able to explain this to someone else. 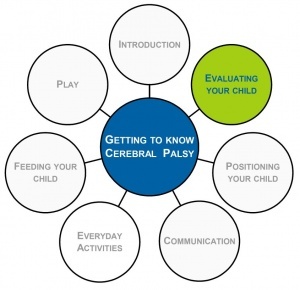 You should be able to observe a / your child with cerebral palsy, and show where on the development chart she is. You should be able to show which activities could be suitable for a / your child to learn next. Now think about other children in your family, or in your neighbourhood. Think about what skills they first learnt as they grew and developed? Now look at these four sentences that talk about different types of skills. Being able to communicate in some way with others, allows us to have and build a relationship with them. A child with a disability can learn to help with self-care skills even if she is not able to move around from place to place, or walk. ALL children have the potential to learn and develop these skills through a sequence of steps. BUT, each child will learn and develop at her own pace and in her own way. Before you can look at how your child has developed, we need to understand how development usually happens. 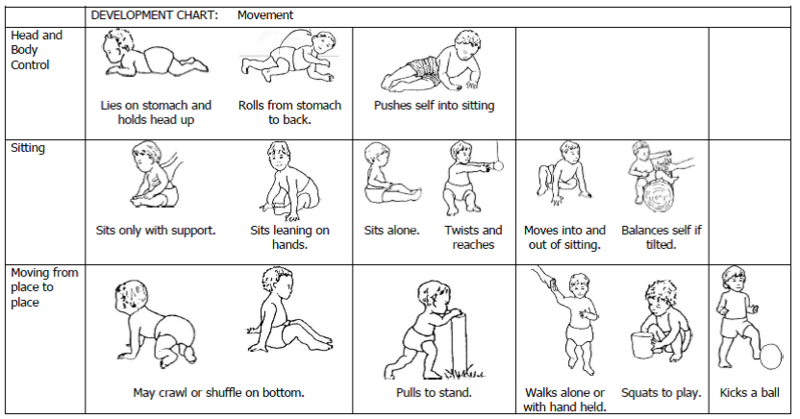 These pictures show the sequence in which children usually develop some of their movements. But children don’t just develop their muscles, or movements, they also develop in communication, in their social and emotional skills like selfcare activities and relating to others, and in their thinking and playing. This development will carry on, unless something happens or is missing to stop or slow the development. feel. Communication is not just talking. the names of things, understanding how to do things. Children mostly do this by playing. 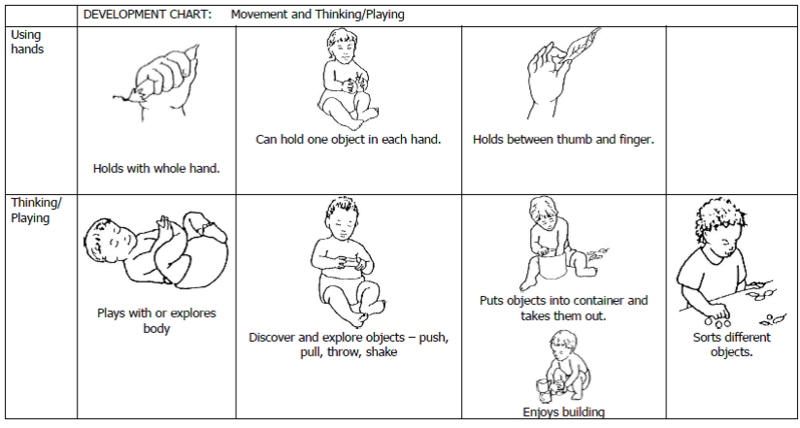 Babies practice by doing the same activity over and over and over again until they get better at it. But we have also learned that a baby or child with cerebral palsy has damage to areas in her brain, and therefore may not be able to move by herself, or perhaps only with great difficulty. Or maybe when she does try to move by herself, her tongue or limbs or head keep going into really difficult positions. Can you think how you have seen your baby / child trying to do things? And what happens? So what does a baby / child need? So she can’t practice by herself. That is why development in a child with cerebral palsy is slowed, or blocked, or seems to be stopped. If your child has difficulty practicing on her own, you will have to help her practice, over and over again. 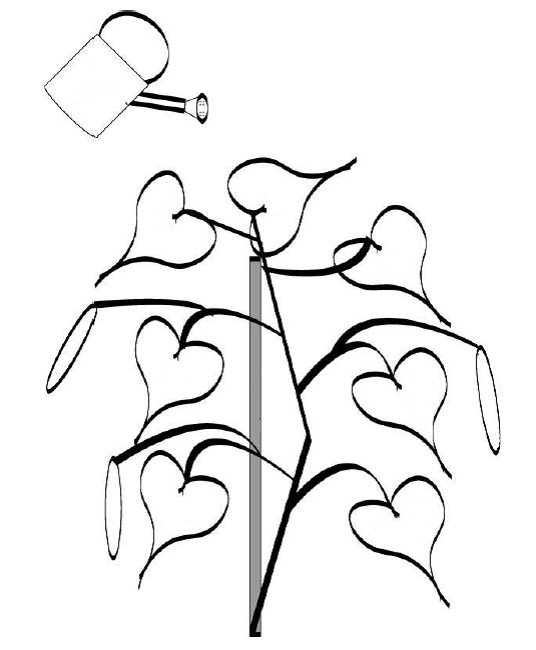 This diagram of a bean plant illustrates the development of a child. Have you ever grown a plant? Was it easy? What did the plant need in order to grow? Many plants need help to grow and develop well. Just as the plant needs water to help it grow, so your child needs your help in order to grow and develop well. Have you seen a plant tied to a stick when it’s young? 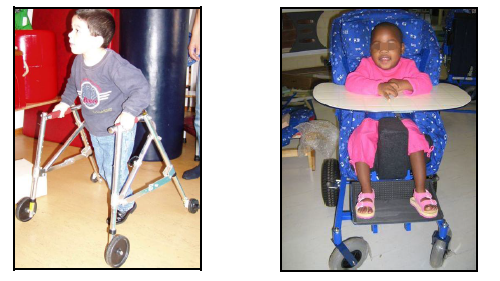 Just as some plants need a stick to help them to grow up straight, so your child may need assistive devices like a buggy or a wheelchair or a standing frame to help her to be in a good position so that she can learn to use her muscles and help them to grow and develop well. 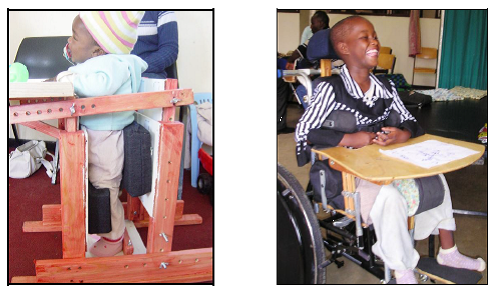 Thus a child with cerebral palsy needs extra time and extra help to keep developing. do. When you have finished, the chart should show where your child fits in each row. HINT: It is possible and likely to get ticks in one row more or less advanced than ticks in another row. So do not go with what the age of your child is and where you think they should be, but with WHAT YOU CAN SEE THAT YOUR CHILD CAN DO, OR IS TRYING TO DO, OR WANTS TO DO. You can get other members of your family, or community, to help you with this. Do it over a number of days or different periods of observation. If you take your child for therapy, you might like to take the chart with you and discuss it with the therapist. Remember, there is no right or wrong. You are building up a picture of where YOUR child is with her development. 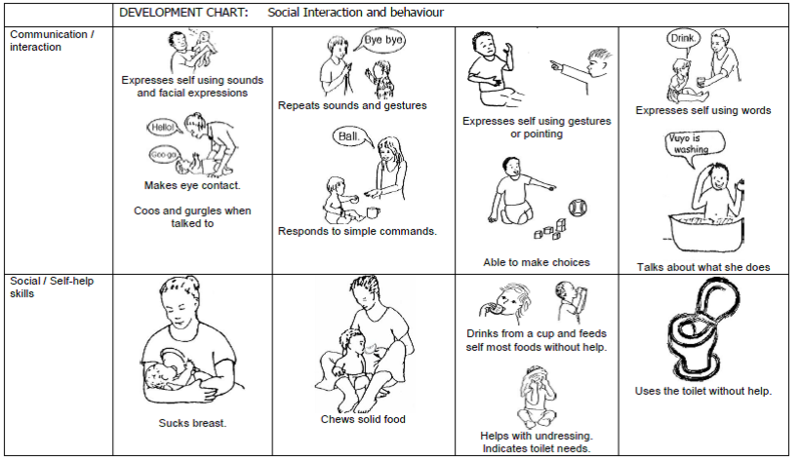 Let’s Communicate – A handbook for people working with children with communication difficulties, World Health Organisation, Geneva (1997). Cerebral Palsy, ga se boloi (it’s not witchcraft), Physiotherapist Department of Gelukspan Center, Reakgona.